A Cessna 550 Citation II corporate jet, registered N262Y, suffered substantial damage in a runway excursion accident upon landing at Manteo-Dare County Regional Airport, NC (MEO). All seven on board survived. The flight departed Tampa International Airport, FL (TPA) at 06:29 EDT on a domestic flight to Manteo. The en route portion of the flight was uneventful. As the flight approached Manteo, the copilot obtained updated current weather information at twice. Both times the weather had deteriorated. The pilot in command (PIC) stated that they would fly one approach and take a look. If it did not look good, they would divert to Elizabeth City Regional Airport, NC. The flight crew received a GPS runway 23 approach, circle-to-land on runway 5. The airplane was initially fast on approach, and the copilot could not deploy approach flaps when the PIC requested, as the airspeed was above the flap operating range. The PIC subsequently slowed the airplane and the copilot extended flaps to the approach setting. The PIC also overshot an intersection but quickly corrected and was on course about 1 mile prior to the initial approach fix. The airplane crossed the final approach fix on speed (Vref was 104) and on altitude, with the flaps and landing gear extended. The copilot completed the approach and landing checklist items but did not call out items as the PIC preferred co-pilots complete checklists quietly. The PIC then stated that they would not circle-to-land due to the low ceiling; however, a landing on runway 23 would be ok as the wind was at a 90-degree angle to the runway and there was no tailwind factor. However, based on the reported weather, a tailwind component of approximately 2 knots existed at the time of the accident. The copilot had the runway in sight about 200 feet above the minimum descent altitude, which was 440 feet. About 300 feet above the runway, the PIC stated that the airplane was high, and the copilot mentally prepared for a go-around but did not call for a go-around. The airplane touched down at 100 knots, between the 1,000-foot-marker and the runway intersection, which was about 1,200 feet beyond the approach end of the 4,305-foot-long runway. Both pilots stated that the speed brakes, thrust reversers, and brakes worked properly, but the airplane departed the end of the runway about 40 knots. The airplane slid off the end of runway 23 and came to rest about 50 feet into the Croatan Sound. As witnesses arrived at the accident site, all of the occupants had exited the airplane and were climbing up the embankment. PROBABLE CAUSE: "The pilot-in-command's failure to maintain proper airspeed and his failure to initiate a go-around, which resulted in the airplane touching down too fast on a short, wet runway and a subsequent runway overrun. 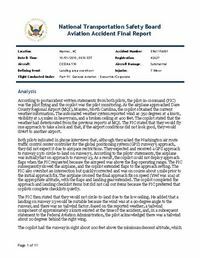 Contributing to the accident was the copilot's failure to adequately monitor the approach and call for a go around and the flight crew's lack of proper crew resource management." Distance from Tampa International Airport, FL to Manteo-Dare County Regional Airport, NC as the crow flies is 1086 km (679 miles).